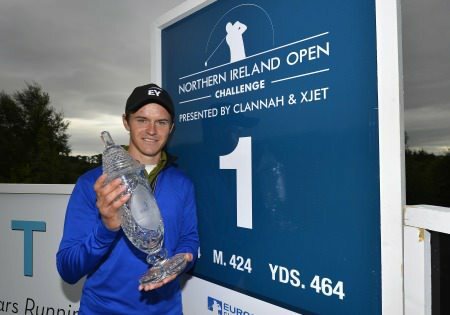 A two under 69 left the Clandeboye man tied for ninth on six under but eight shots adrift of Swede Joakim Lagergren, who sot a 66 to move one step closer to sealing a maiden European Challenge Tour title. The 22 year old's five under par third round put him six clear and on course for a wire-to-wire victory. “I was surprisingly calm out there,” said Lagergren, who is now 14 under par. “I had no worries at all and kept calm all day. It’s always a bit nervous on the first tee but I was hitting good shots in the beginning and I got off to a good start so I think that’s a good thing. “Then you are calm all day instead of getting angry when you’re hitting bad shots. The start was good for me today." 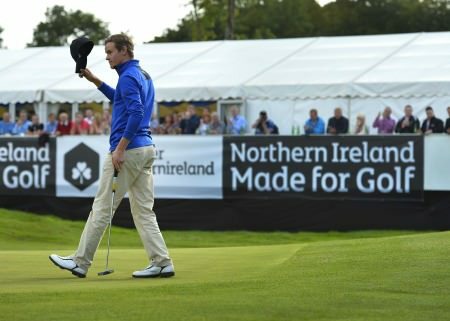 Lagergren won three times on the satellite Nordic Golf League before earning a European Tour card for the 2012 season via Qualifying School, so he feels he is well capable of handling the pressure on the final day at Galgorm. Certainly, he feels he has formed a special bond with the local fans, who have turned out in their thousands this week and are expected to set a new Challenge Tour attendance record on championship Sunday. “The crowds have been great,” he said. “They are great fans, they have been cheering me on. I think there is something there, they really are urging me on. It’s really nice. “I played with Dermot (McElroy, local amateur) the first two days and it feels like those fans were still following me today so it has been special." There is still some hope for the chasing pack at the pristine Galgorm Castle, with Englishman Oliver Wilson having come from seven shots behind here last year to earn a play-off, although the former Ryder Cup player eventually lost to Dutchman Daan Huizing. Huizing’s compatriot Tim Sluiter (68), England’s Max Orrin (68) and South African Brandon Stone (69) were all faced with the task of hunting down the lead as they shared second place on eight under par heading into the final day. Former European Tour winner Rhys Davies of Wales was one of four players a shot further back on seven under, while Caldwell was the best-placed Northern Irishman as he carded a two under 69 to finish the day on six under for the tournament. Gareth Shaw shot a 69 but fell two spots to tied 16th on five under as McElroy shot 74 to fall back to tied 49th on one over. Niall Kearney (72) is tied for 54th on two over with Mark Mruphy (74) a shot futher back while Irish Amateur Close champion John Ross Galbraith could only manage a 75 after his heroics earlier in the wek and is not tied for 61st with Rathmore's Alan Dunbar, who shot 73.